The selection of seeds and feeds from our range of other/mixed cage bird food includes various flavourful and nutritious options for birds who might lie a little out of the mainstream. Whether you need the right mix for a hummingbird or tanager, these specific products contain everything they need to maintain a perfect condition of health. 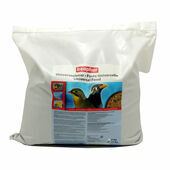 Also available in our other/mixed cage bird food range is a high volume bag of universal bird food – an all-purpose feed that is ideal not only for softbills and native songbirds, but even as an occasional feeding choice for hardbills.